The Water Framework Directive was adopted in 2000 and requires member states to manage their water resources on an integrated basis in order to achieve at least ‘good’ ecological status. The first cycle of River Basin Management Plans for Ireland was published in July 2010 and planning for the second cycle is underway. The Directive runs in 6 year cycles, so the second cycle runs from 2016-2021. In the second cycle, there will be a single national approach for the development of river basin management plans within the State. A new three-tier governance structure has been established. At Tier 1, the key national actors – led by the Minister – will deal with policy and resource matters. The EPA will lead on the underpinning science at Tier 2 and local authorities at Tier 3 will lead on implementation, enforcement and public engagement at local river level. 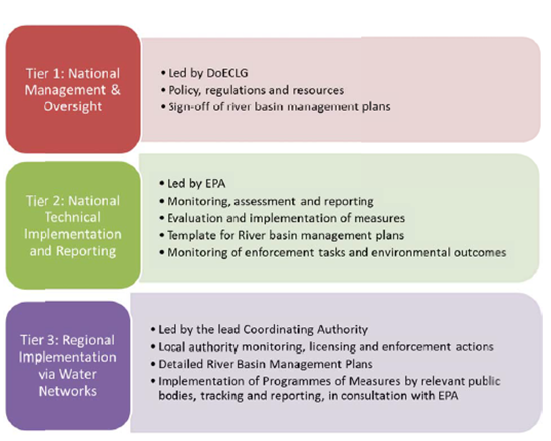 The EPA now have the Draft of the second cycle of the River Basin Management Plan prepared. This is led by the local authorities at a regional level. The draft second cycle RBMPs sets out the quality status of waters in the River Basin District, the proposed environmental objectives and the draft programme of measures to achieve those objectives by 2021. The Waters and Communities Office are hosting public meetings on the latest draft within the coming weeks to discuss the natural waters of county Monaghan. If you are interested in water quality, angling, heritage, biodiversity, amenity use or issues affecting your local waterways then this is an opportunity to have your say and have an input into the final plan. Once the draft plan has gone for public consultation the final river basin management plans will be adopted by the Minister and published in 2017. Those plans will run to 2021. For further information on this meeting please click here.